Pullover tops A, C or gowns B, D have length variations. Pull-on shorts E or pants F, G have length variations and elastic waist. A, B: close-fitting garment. 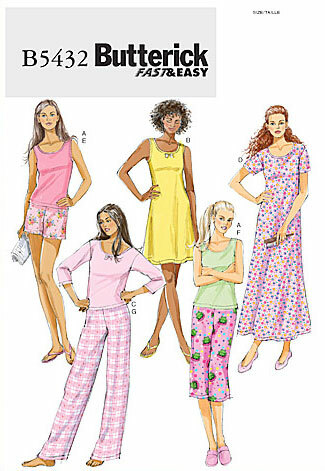 C, D: loose-fitting garments have slightly dropped shoulders and three-quarter length or short sleeves. B, C: purchased bow trim. All garments have stitched hems. Notions description...NOTIONS: Gown B, Top C: Purchased Bow. Top C, Gown D: 1/2" Single Fold Bias Tape. Shorts E, Pants F, G: 11/8 yds. of 3/4" Elastic. Top A, Gown B: † Moderate Stretch Knits Only: Cotton Knit and Jersey. Top C, Gown D, Shorts E, Pants F, G: Flannel, Stable Knit, Satin and Lightweight Broadcloth.